This year we are proud to continue our sponsorship of the Phoenix Film Festival. For one week each April, thousands of movie lovers descend upon the Harkins Scottsdale 101 Cine Capri to celebrate independent cinema. While we enjoy all the movies available to watch, what we really love are the workshops and educational programs provided for aspiring filmmakers, especially those for children. During Kids Day children selected projects from a series of hands-on activity stations focusing on different aspects of film production and geared to various age and ability levels. Stations were age-appropriate and ran the full gamut of the film-making process. Later in the evening was Teen Night. This year the selected screenings were Clueless and Perks of Being a Wallflower. We gave away Bookmans swag. After all of that learning and movie watching, we headed over to the Party Pavilion for Geek Day. We joined our favorite geeks including the Arizona Ghostbusters, Arizona Avengers, Phoenix Comicon and some of our more geeky Bookmans staff for a geeky good time. Think we said geek enough? Well, geeking out is half the fun! There’s still time to enjoy the cinematic fun! 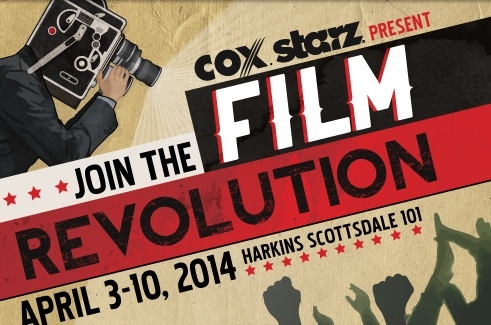 Phoenix Film Festival runs until April 10. We hope to see you at the festival this year and if you can’t make it, stop by your local Bookmans for a copy of your favorite movie. Until we meet again, here’s looking at you, kid.